Farmscape Gardens is California’s largest urban farming company, bringing edible gardens to residential and commercial customers alike. The sustainability focused company has reach over 300 clients since its inception in 2009. A recent expansion into the Bay area reflects the growth of the local food market and the success of the Farmscape business model. “We have a lot of two-income households with kids for whom it’s really important to have access to fresh food in their lifestyle and access to a dynamic landscape, because vegetable gardens change every day, but they don’t have the time to do that. We step in and fill that void,” says Dan Allen CEO of Farmscape Gardens. It all begins with a yard survey, where the Farmscape staff consult with customers and assess their specific growing needs as well as the logistics of the urban farm site. A plan develops into a garden installation. The farm gardens are then maintained on a weekly basis by a Farmscape farmer who weeds, controls pests and harvests the produce. Farmscape customers enjoy a basket of vegetables from their own garden every week. The cost of the service depends on the size of the garden and whether or not the client chooses to subscribe to the weekly farmer maintenance. Most projects are in the $2,500 to $10,000 set-up fee range with weekly maintenance starting at $45. Presently, 80 percent of Farmscape’s clients are residential plots with restaurants and schools accounting for the other 20 percent of their market. 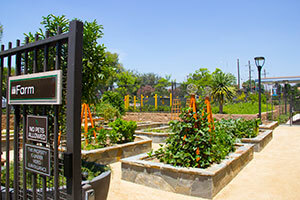 An emerging niche for Farmscape is working with property developers to create high-end edible gardens for apartment complexes. The Farmscape staff includes experienced growers, some with field experience and others with plant science backgrounds. There are 12 employees in their Los Angeles office and two in the new Oakland office. Opened this past spring, the Oakland office already has 15 projects under its belt and maintains 10 gardens on a weekly basis. Many clients and their families go outside when the farmer is working in their yard to learn about the different varietals and to gain a deeper connection with their food and farmer, according to Allen. All Farmscape gardens have a raised bed design, allowing for complete control over the quality of the soil. The farm plots use drip irrigation, organic practices and manual weeding. The main challenge for the Farmscape staff is logistics. “In a city like LA, the advantage is you try to unlock a bunch of underutilized areas and landscapes, but the challenge is the flipside of that, which is that instead of having one big centralized farm, your farm is effectively dispersed across the 150 sites we maintain,” he says. “So its dealing with all the unique site conditions you encounter and also just the logistics of getting people and materials out to each of those site. For would-be urban farm companies, Allen advises streamlining services. Farmscape’s most recent high-profile project is the Jonathan Club in downtown LA. The company’s first rooftop garden, the Jonathan Club installation provides the club’s executive chefs with fresh ingredients on-site, adding to the exclusive quality of their dishes. A social club with its own farmer is a concept the folks at Farmscape are happy to promote and extend to other commercial enterprises. Allen is happy to see the concept of urban farming growing around the country.